This new resource is a practical book on ways to engage people living with dementia in meaningful leisure activities. 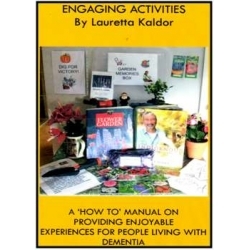 The book includes general guidelines as well as some practical activities for people in the different stages of dementia. This book contains prepared programs to be used as a basis for providing quality activities at a day centre or residential facility. All activities can be easily adapted by staff or family who care for the person living with dementia at home.There are themes, pictures to color, and templates that can be photocopied.